When I opened the email titled “Patented Bike Pedal,” I was surprised and a little skeptical of the author’s credentials. A cabinet-maker by trade, Mike Lohmeyer said he and his “partner in crime, Frank,” had developed a clipless road pedal and cleat that could make waves in the cycling industry. But as a staunch commuter and road cyclist, I responded, curious what innovation a cabinet-maker — Mike Lohmeyer — could provide an industry plagued by stagnation. Turns out, Lohmeyer and “Frank” engineered — and possibly perfected — a modern take on the AeroLite pedal that dates back to the ’70s. 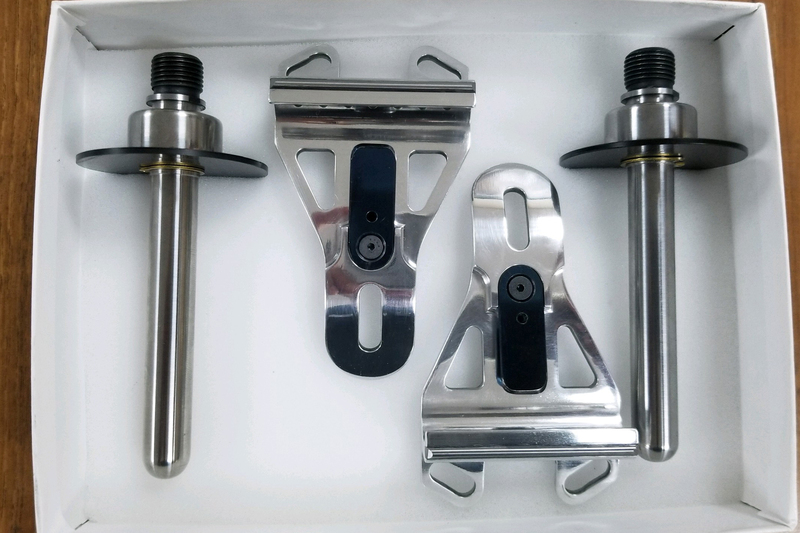 A single stainless steel bar, the pedals offer the most basic clip-in platform possible. 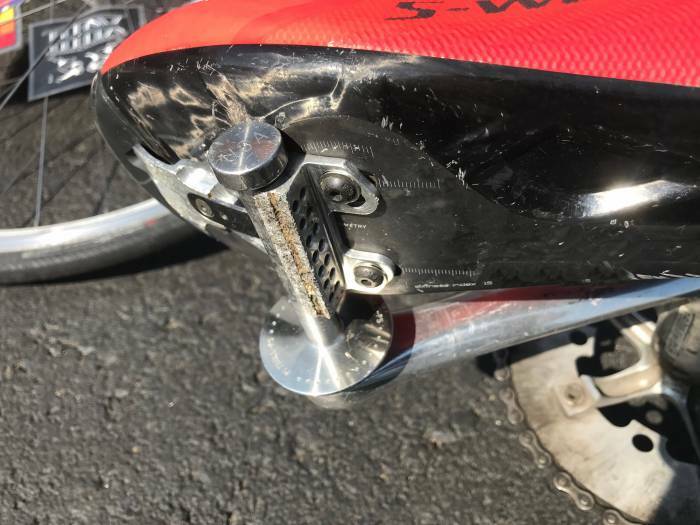 Paired with the patented hook-like cleats, Lohmeyer’s system, dubbed “Pitbull Pedals,” touts itself as the quickest-to-engage clipless setup out there, and one that addresses concerns over similar designs of the past. 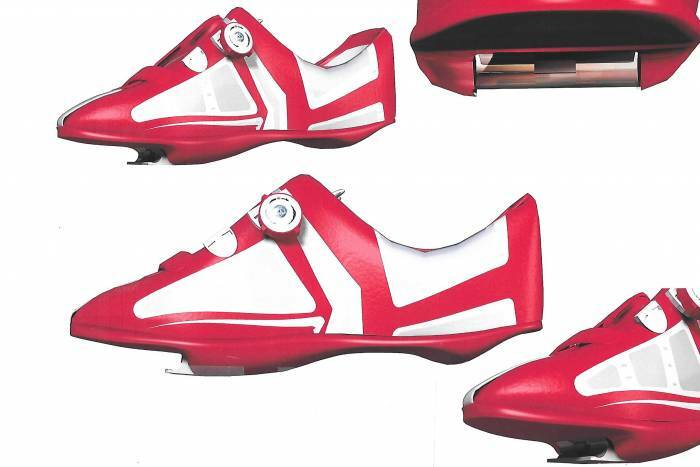 In short: The Pitbull pedals and cleats will immediately conjure visions of the AeroLites. While Lohmeyer and his partner have worked to address issues those pedals faced, it’s still the same principle. But these pedals lived up to their hype — near instant engagement, strong grip, and ease of use. It may not be for the Tour de France, but the Pitbull Pedal system provides a simple, reliable option new riders and weekend warriors. Right off the bat, you need to know there is no price for these pedals. This was a full-on prototype test. But if he can find seed funding, Lohmeyer plans to scale up the Pitbull system into production. But for those who followed the AeroLites and maintain interest in the concept, here’s what we found in our preliminary tests. First off, these are not the super-lightweight option core racers seek. But at about 4.5 ounces (127.5 grams) per pedal, they’re not overwhelmingly heavy either. For comparison, these are nearly 100 grams heavier than the lightest AeroLite option. But they’re still about 100 grams lighter than the Shimano Ultegra carbon-steel pedal. Each pedal consists of a stainless steel bar with an inner flange and slight taper at the outside edge. 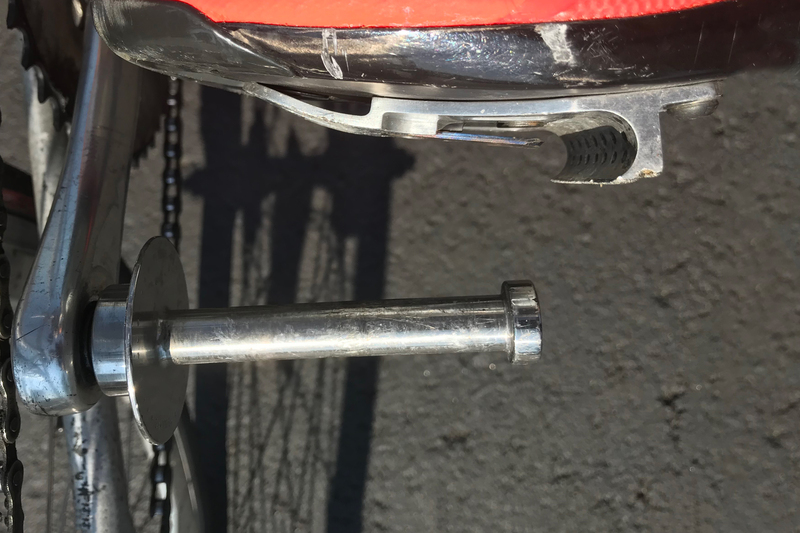 The pedal is a little wider than the cleat, so there’s some fudge room to clip in. But I found the strongest bite when the cleat butted up against the flange. The pedals spin freely on a spindle and install like any other race pedal. They tighten with a standard Allen wrench on the inside of the crank arm. Of course, to use the Pitbull pedals, you need the Pitbull cleats. These install on any standard road shoe, with three screws along the sole. Though it operates on a similar principle to the AeroLites, there is a key difference in Lohmeyer’s system: Whereas AeroLites used a plastic cleat that faced downward, the Pitbulls use a metal cleat that faces forward. Ostensibly, this allows riders to engage more naturally, pushing the foot forward with the pedal stroke and engaging at the same time. The cleats’ strength derives from a piece of spring steel. Basically, it’s a steel tongue that bites against the pedal. This is also where the tension and strength in the system derive. 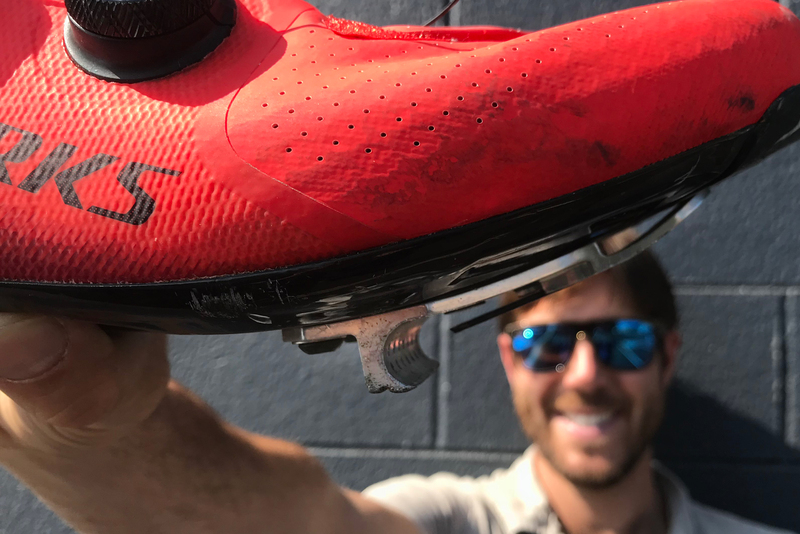 Unlike typical road cleats that adjust on the pedal, the Pitbull system adjusts from the cleat. Riders can adjust the cleat’s spring steel to make it stiffer or more flexible. One more note on adjustability: The major difference between AeroLite and the Pitbull system, Lohmeyer claims, is the addition of float. The AeroLite system receives criticism from some cyclists for its lack of float. Lohmeyer worked with his partner to engineer float, which he demonstrated in a prototype here. However, this can’t be achieved with a simple adjustment — it requires different cleats altogether. Lohmeyer said once scaled to production, riders will choose either adjustable-float cleats or no-float cleats. So how did the Pitbull system work? Short answer: Great — for a prototype. I rode on the pedals through and around Denver for a few hundred miles over the summer. In that time, I wrenched a few sprints from a dead stop and added in some 30-plus-mile weekend rides. These pedals excelled in ease of use. As Lohmeyer advertises on his YouTube channel, this system is quick to engage and requires almost no extra attention or effort. From a dead stop, the cleats naturally bite into the pedal virtually every time. Still, there’s a small learning curve — especially for those used to orienting road pedals before snapping in. But once you’ve mastered pushing forward into the pedal, it’s easy. And because the pedals are round, riders can virtually always engage the pedals without looking down. 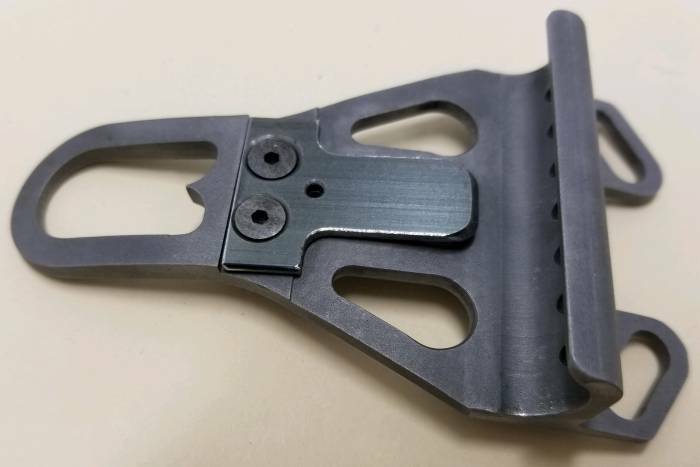 We tried a similar update to the “bar pedal” design years ago. While that proved extremely light, we had trouble clipping reliably. The Pitbull update, however, excelled in ease of use thanks to its large clip-in surface. This comes with a few extra ounces, but Lohmeyer isn’t aiming at a Tour-ready pedal with this system. Also, the Pitbull system is strong. I did manage to pull out of the pedal once, but it took considerable effort and occurred while I was trying to do so. Plus, I wasn’t on the cleat’s stiffest setting. With the spring steel’s adjustment screw, I added more bite once I was used to getting into and out of the pedals. Overall though, the system held as strong as any road pedal I’ve tried. But the pedals aren’t entirely different from other road options. Unclipping was the same as any other system I’ve used: A quick flick of the heel released my foot. While I enjoyed riding with the Pitbull system overall, there were some drawbacks. The most egregious issue with these cleats is the profile on the shoe. 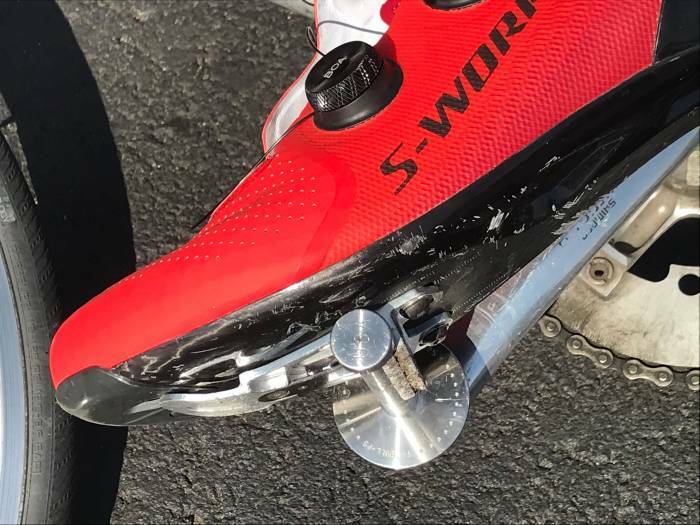 These cleats stick out much more than standard road cleats, and those are a pain already. Because this was a prototype set, I refrained from walking around as much as possible. I found it extremely difficult to walk into the office or a coffee shop wearing the cleats. The cleats protrude quite far from the front of the foot, so you can’t even feign a normal gait. I asked Lohmeyer about this, and he claimed to have developed a shoe to specifically house the Pitbull cleats and make them less obtrusive (see image above). That may be a better option for anyone who uses these in town because the cleats are a hassle on any standard road shoe. The only other issue I noticed was durability. While the stainless steel pedals will take a beating, the cleats I received were aluminum. 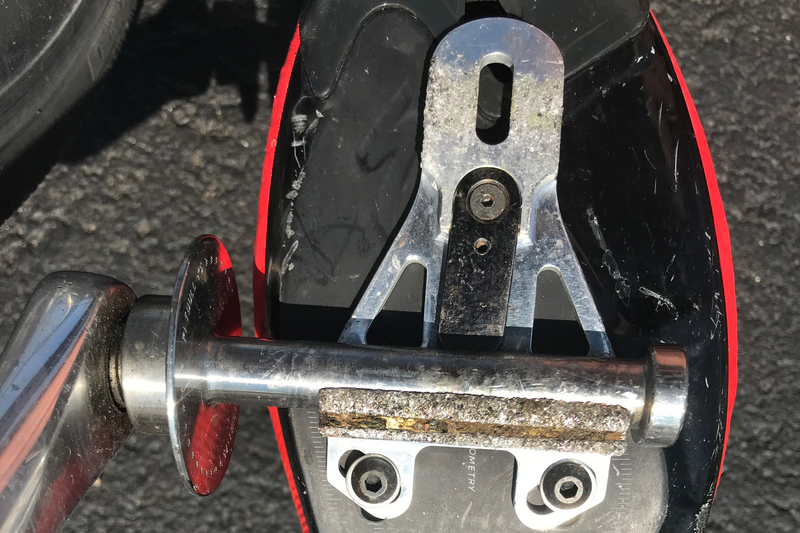 This kept weight down (about 1.5 ounces per cleat), but they quickly took on battle scars. I asked Lohmeyer about this too, and he sent along Pitbull prototype 2.0. These are made of stainless steel and are about twice as heavy as the aluminum option. But their strength is far greater. Lohmeyer said he was aware of the wear issue and expected the steel version to be the best choice going forward. Pitbull: A Better Road Pedal? Should you be excited about the Pitbull system? That depends on what you’re after — and your budget. According to Pitbull’s creators, they expect the system “would be marketed alongside the medium- to high-end pedals currently on the market.” That likely puts it over $100 per pair. For that, you get a relatively lightweight pedal that’s very easy to use, works reliably, and offers quick off-the-line engagement compared to other road options. And it will definitely receive looks and questions from fellow cyclists. The brand will need to address the walkability and dial in the durability to really woo the market. But if it does, as Lohmeyer has said he has, Pitbull pedals may well find their way into group rides and weekend pelotons.